Chaos and confusion struck as soon as Stephen Paddock allegedly started firing at a country music festival on the Las Vegas Strip on Sunday night. Interested in Las Vegas Shooting? Add Las Vegas Shooting as an interest to stay up to date on the latest Las Vegas Shooting news, video, and analysis from ABC News. According to the latest figures from officials, at least 59 people were killed, including the gunman, and 489 others were injured as a result of the shooting. Police revised the number of injuries after realizing some were counted twice. In the wake of the deadliest mass shooting in modern U.S. history, a timeline has begun to emerge. Paddock checks into the Mandalay Bay Resort and Casino, three days before the shooting, according to Las Vegas police. Sunday, Oct. 1, 10:05 p.m.
Country singer Jason Aldean is onstage during the closing night of the Highway 91 Harvest Festival when shots are fired. Videos show that many people, including Aldean, do not identify the sounds, with some in the crowd apparently thinking they are from fireworks or something that is part of the act. The first call by police has an officer reporting, "Shots fired" and "sounded like an automatic firearm." Map shows an aerial view of the Mandalay Bay Hotel and Casino, the surrounding areas and the vantage point the shooter had from the hotel. "It's coming from upstairs in the Mandalay Bay. Upstairs Mandalay Bay, halfway up. I see the shots coming from Mandalay Bay, halfway up," the officer says. The Las Vegas Metropolitan Police Department responds to the call and begins searching for the shooter. The first two officers arrive on the 31st floor of the Mandalay Bay and announce that gunfire is coming from directly above them. The last shots are fired by the suspect, as determined by bodycams worn by officers. Clark County Sheriff Joseph Lombardo said today that they believe the shooting lasted for nine minutes after the first 911 call. "The best of our estimates and video review, he continued to fire at a progressive, successive rate for approximately nine minutes," Lombardo said at a news conference Tuesday. The first two officers arrive on the 32nd floor. Security officers for the Mandalay Bay tell Las Police officers arriving on the 32nd floor the exact location of the suspect's room. 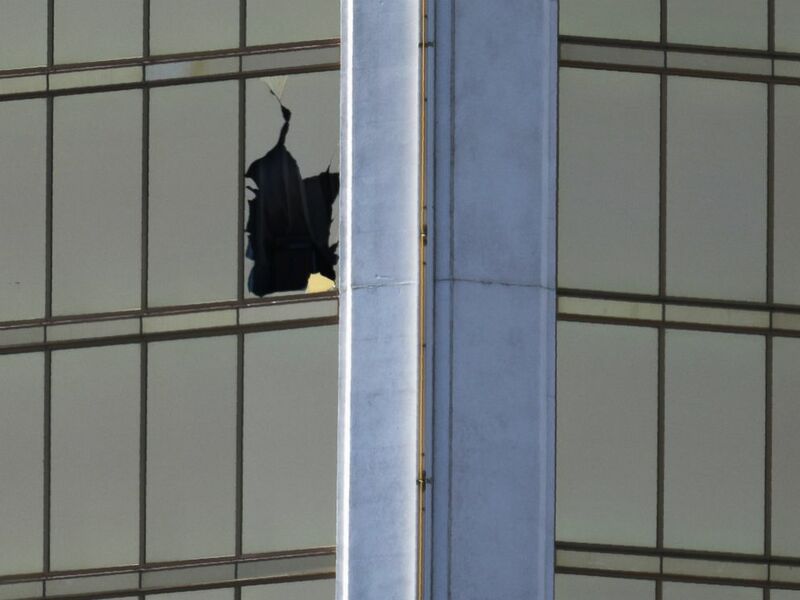 Eight additional officers arrive on the 32nd floor and begin to move systematically, clearing each hotel room and looking for injured people. Police said they began this process because they were no longer hearing any gunfire from an active shooter. Dr. Jay Coates, a trauma surgeon at the University Medical Center of Southern Nevada, receives a call to report to the hospital, according to The Las Vegas Review Journal. "They were coming in so fast. We were taking care of bodies. We were just trying to keep people from dying," he later tells The Associated Press. "Every bed was full." The Las Vegas Metropolitan Police Department posts its first tweet about the shooting, telling people to avoid the area near the Mandalay Bay hotel. 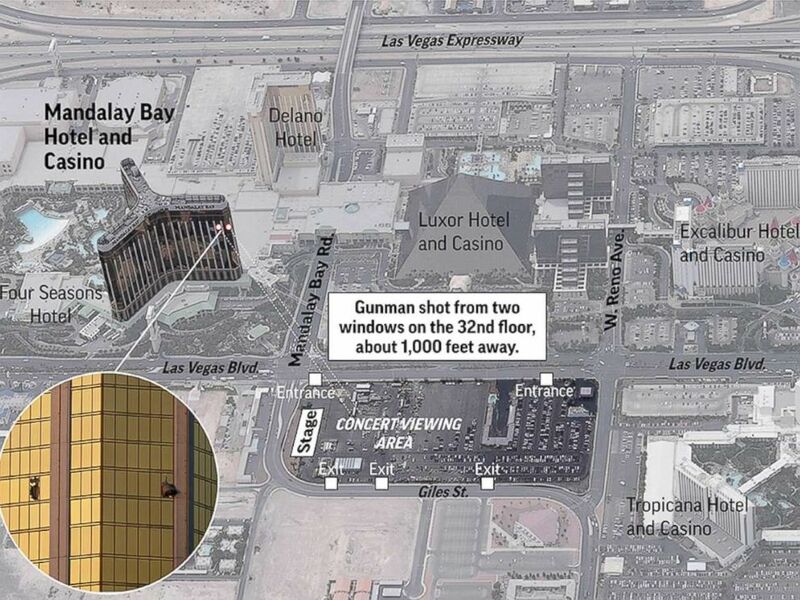 Eight Las Vegas police officers arrive in the stairwell at the opposite end of the hallway from the shooter's room. First responders radio in that they are at the end of a hallway on the 32nd floor but are cautious to avoid fire from other first responders. "We are going to be peeking out into the hallway. Those officers down the hallway are going to need to acknowledge so we don't have a crossfire," one says. Police dispatch recordings hear first responders breach suite 135 on the 32nd floor of the Mandalay Bay hotel. "Breach, breach, breach," an officer is heard saying. A broken window is seen at The Mandalay Bay Resort and Casino following a mass shooting at the Route 91 Festival in Las Vegas, Oct. 2, 2017. Police confirm one suspect is down in the room, and note a second door that cannot be accessed from their position. The second breach is set off allowing the officers to investigate the second room. Officers realize no one is in that room and announce over the radio the suspect is down. "We've got one suspect down. Multiple firearms. This is definitely the place where they fired into the crowd," an officer says in the radio dispatch recording. Monday, Oct. 2, 12:31 a.m.
Police clarify earlier reports, stating via tweet, "We do not believe there are any more shooters." 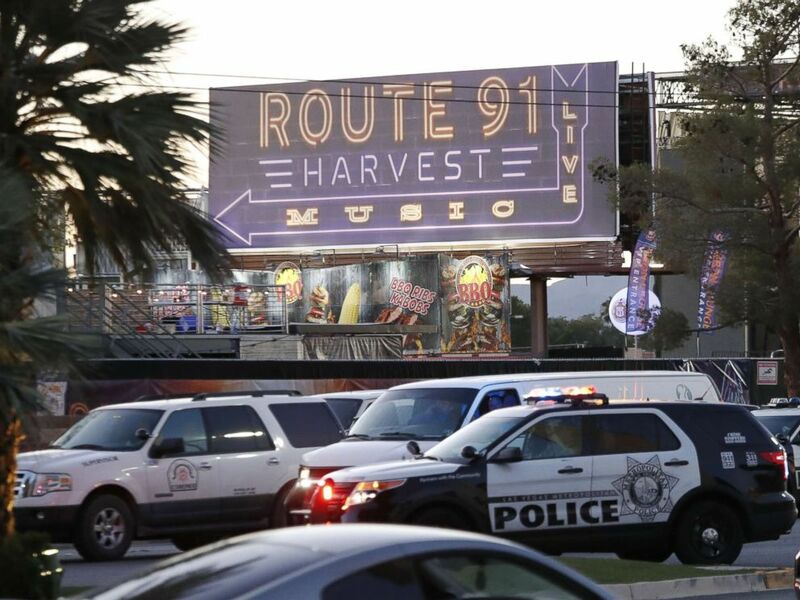 Las Vegas Metropolitan Police in front of a sign for the Route 91 Harvest festival near the scene of the mass shooting at the Route 91 Harvest festival on Las Vegas Boulevard in Las Vegas, Oct. 2, 2017. Aldean posts a message on Instagram. "Tonight has been beyond horrific. I still dont know what to say but wanted to let everyone know that Me and my Crew are safe. My Thoughts and prayers go out to everyone involved tonight. It hurts my heart that this would happen to anyone who was just coming out to enjoy what should have been a fun night. #heartbroken #stopthehate," he writes.